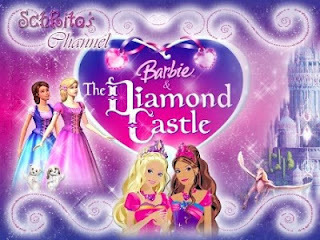 Ada film favoritenya Aiz, film Barbie judulnya Barbie And The Diamond Castle. Ada lagu yang lumayan bagus di film itu, si aiz suka banget, dah coba tulis2 liriknya, eh ternyata di inet ada kok hehehehe. And how you know, all of my jokes, but you laugh anyway! wherever you go in this world I'll come along! Together we dream the same dream. Forever I'm here for you, you're here for me. you know I'll be around. I'll listen for the sound! If I could wish for one thing, I'd take the smile that you bring. Wherever you go in this world, I'll come along! Untuk lagu selanjutnya setelah browsing kanan kiri, dapet lagi nih lagu2 selengkapnya di film itu. Touching at the speed of...Life oo..oo..o..
How did you get to be so good looking? And our style is a BIG BIG PLUS! wow you belong,ooh you belong wow you belong!